Note: Not to be confused with Fred Sargent, who played for Argyle in the first season after the war. Sargeant was one of six Pilgrims who made their Argyle debut in one of the three games of the abandoned 1939-40 season. An outside left with an eye for goal, he was born in the colliery village of Cornsay, just south of Consett in County Durham. He started his career as a youth with Esh Winning Juniors – named after another Durham colliery village rather than supreme optimism – before then playing for Washington Colliery, Bishop Auckland, White-le-Head Rangers and then Ushaw Moor. It was at the age of 21 that he made the breakthrough when he signed for Norwich City in 1930, where he played 13 times and scored his debut Football League goal. The following year he moved to Bristol City, playing 27 times and scoring an impressive 10 goals. In 1932 he joined Hull City, scoring 16 goals in 60 appearances before moving a year later to new boys Chester City, who had been elected to the League just two years before. The move turned out to be the most productive of his career; in a four-year spell he played 153 games and scored 51 goals – a remarkable return for an outside right. In 1937 he moved on to Stockport County where he continued to be prolific, scoring 19 times in 49 appearances. It was from Edgeley Park that Sargeant moved to Home Park in the summer of 1939, playing in all three matches of the abandoned Football League competition, and then regularly in the South West Regional League until the end of the 1939-40 season. He joined the Army (his name must have caused amusement in the ranks) and was later taken as a prisoner-of-war whilst serving in North Africa. 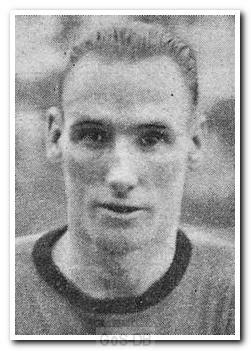 After repatriation in 1945, he played two games as a guest for his old club Chester City at the end of the 1944-45 season. However, having played the majority of his career before the war, by the time the full Football League programme resumed in 1946-47, he had retired from football.